I'm starting a cleaning business, but don't know where to start. What's my first step? Your first step is to learn all you can by signing up for our CleanZine. You will get weekly advice from Suze and Evan as well as a Quick Start Guide. Then take a look at the all-in-one business solution, the Clean Up Now System. The Clean Up Now System is the most advanced cleaning business system ever designed for starting and running a cleaning business! We have been building this tried and true system since 2004. 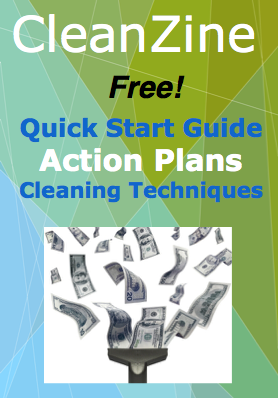 It has been tested by thousands of cleaning service businesses. Multiple layers of protection are engaged. Your order is protected by McAfee Secure testing service & Norton Security provided by VeriSign. Start-cleaning-business.com has no access to your personal information, only the order processor does. We have access to your email address only. We do not share your email address with anyone, ever. You can use Stripe, Paypal or ApplePay to process your order. All major credit cards are accepted. It is a secure connection on their server via https. The order is not processed on our server. Our low refund rate attests to the quality of the service. Since we use Stripe, PayPal or ApplePay to process orders, you always have access to a transaction resolution expert as a part of the Buyers Protection Plan. In addition, you may chat whenever you like with Evan, using the live chat on our website. Ask questions or clarify any concerns prior to or after you place your order. The order form process did not complete. It may be your browser or the browser settings. PLEASE make sure your browser is up to date. This is much more of an issue than it was in the past - for all website services. Please update (or switch browsers) and try the order again. You can contact Ev to assist you. Are you guys really just Suze & Ev? Yes, it's just the two of us. Chat with Evan right now to find out for yourself. Check out the 'Meet Suze & Ev' page. Visit our Facebook page and see our interactions with prospects and clients alike. Like every other business in these transparent times, ours is all out in the open and above-board, just the way we prefer it. Monitor our Twitter feed and hashtags that use our name. No problems there. Search for Clean Up Now System. We have not had one unsettled dispute since we started in 2004. We are dedicated to the proposition that there is always a win win outcome. Go ahead and initiate a chat. If Ev is away from the computer, rest assured he won't be for long! He will respond to you as soon as he can. Sign up for the CleanZine and get our phone number and talk to Evan or Suzanne directly. Can I talk to you on the phone before I purchase? Yes! Our business phone number is (828) 767 1181. This call is an opportunity to learn about our services and verify that we are who we say we are. I just purchased and I have not received anything. You had immediate access on the confirmation page. You will also receive a follow up email. Sometimes customers miss the link on the confirmation page. Contact Ev and he will give you access to the portal asap. Are there any additional fees with the system? No. That is one of the many things that distinguishes us from the competition. It is a one-time fee for the business system. There is a monthly maintenance / upgrade fee for the website service. Does your system include business forms and contracts? Yes, the Clean Up Now System has 30 plus editable forms and contracts. How do I order a website for my cleaning business? We offer a custom cleaning business website as a part of the Clean Up Now System. Yes, you will need to purchase a domain name, all website must have one. We make it easy for you to do so. Will I need to purchase hosting? Yes, you will need to purchase hosting for your website, we make this easy for you. The website is usually completed within 7 - 10 business days upon receiving your design form submission. We work with you over email as we build the website. The website included with the system contains up to 7 pages, depending on which pages you choose. We offer additional custom website design services at incredible prices. You will see these additional services in the Add-Ons section of the business system. Can I see some examples of the website design? Yes, feel free to view finished client websites on our portfolio. Can I accept credit card payments with my website? Yes. Your website comes equipped with a PayPal payment page. Customers can go there to conveniently pay for your services using a credit or debit card. We can include other payment set-ups as well. Those options are covered in the system. No, access to the files is not available, we make all the updates, edits and upgrades for you. You do not need to have any skills in that area. Can I use your services where I live? Can I start a cleaning business in the UK with your method? What about Canada and Australia? Yes! Our system is optimally designed for use in the United States but it does work great in Canada, UK and Australia! We have customized our services to work in those locations. Can I use your services in... Russia, Africa, Asia, Middle East, Non-English speaking parts of Europe? No, we do not advise it. We lack the experience and context to offer business advice to people residing in those countries and cultures. As much as we would like to help everybody, we are simply not able to. The price of our systems, for many people, would also be prohibitive because of the differences in currencies. We fight and report all chargebacks as fraud because there is absolutely no reason to file a chargeback, we are always available to communicate with about the service. The terms are clearly laid out on this website. Chargeback fraud has increased at an alarming rate. A chargeback is NOT a refund! We are always available to work some thing out with you including a refund if it fits our refund policy guidelines. It is foolish to commit chargeback fraud because all of the banks are using machine learning algorithms to track your behavior.